When reading this post about the Facebook SDK writing a line to your Android phone's log file, I was interested to see what other applications wrote sensitive data to the log. Allows the app to read from the system's various log files. This allows it to discover general information about what you are doing with the tablet, potentially including personal or private information. From what I have seen, that word "potentially" needs to be changed to "most definitely". On my Samsung Galaxy S2, I found that all my texts and emails were written to the log file in plain text. I even wrote a proof of concept application to read my emails. I see no good reason as to why applications would need to write any private data to the log. The permission is there in the first place for easy debugging which makes sense, but just writing whole emails and texts to the log makes no sense. When I receive a text, a notification is written to the notification bar which includes the text contents, including the name of the contact - this whole string, for some reason, is written to the log file. Likewise whenever I open an email in the Gmail application, the whole content of the email is written to the log file. I did try and reach out to Google and Samsung about this issue, but after a couple of weeks have not heard anything back. Application developers should be careful writing to on-device logs. In Android, logs are a shared resource, and are available to an application with the READ_LOGS permission. Even though the phone log data is temporary and erased on reboot, inappropriate logging of user information could inadvertently leak user data to other applications. It was my birthday the other day, yey, Happy Birthday to me and I had a nice surprise from Google. I thought it was for a famous birthday but on clicking the logo, it took me to my Google+ page! Nice touch, thank you. The 3D view of the page structure allows you to pan around and zoom using WebGL. More details are on the Mozilla Development Blog. 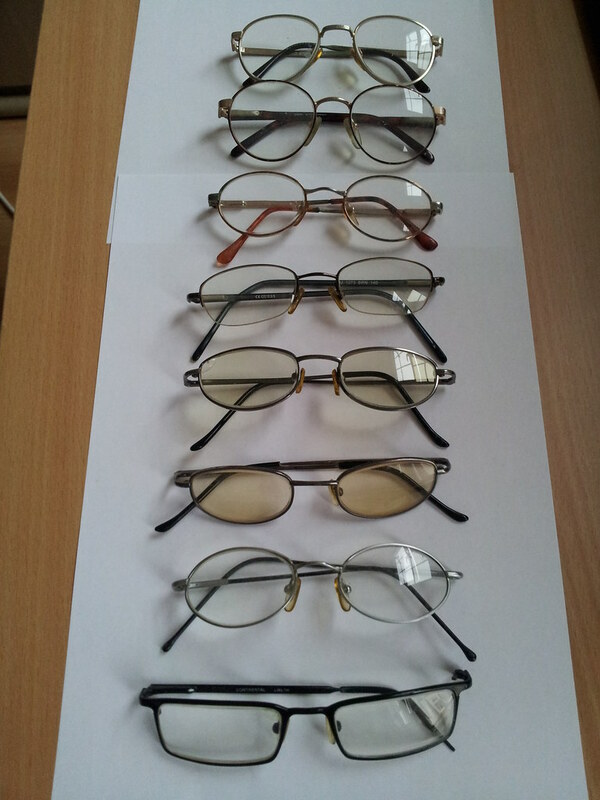 This is a sample of the numerous pairs of glasses I have been through in 20 years. They are, what I can tell, in chronological order, oldest at back to most recent at front. They have been accumulating in my house. I took them to the opticians today for recycling, they were very grateful.